Rev. George M. Kuryvial, OMI, 85, died on August 7, 2018, at the Dammert Care Center of The Esquiline (Apartment Community) at the National Shrine of Our Lady of the Snows, Belleville, Illinois. Fr. Kuryvial was born to the late John and Anna (Staroba) Kuryvial in Chicago, Illinois on February 23, 1933. After his primary education, he began his journey to the priesthood and the Missionary Oblates of Mary Immaculate at Our Lady of the Ozarks College and minor seminary in Carthage, Missouri, in 1946. In 1952, he entered the Oblate Novitiate in Godfrey, IL, where, a year later, he pronounced his first vows as an Oblate. He completed his studies for the priesthood at Our Lady of the Snows Scholasticate in Pass Christian, MS, and was ordained a priest in 1958. 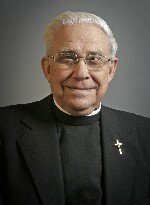 In his 60 years of priestly ministry, he served in the following places: 1960-61 – Associate Pastor at St. Thomas Parish, International Falls, MN; 1961-62 – teacher at Our Lady of the Ozarks minor seminary, Carthage, MO; 1962-80 — teacher at Lincoln State School, Lincoln, IL; 1980-86 – Director, Pastoral Office for Persons with Disabilities, Diocese of Lansing, MI; 1986-92 — Consultant for Special Religious Education, Diocese of Joliet, IL; 1992-93 – Sabbatical; 1993-95 – Pastor, Sacred Heart Parish , Mountain Grove, MO; 1995-96 – Staff at St. Mary’s Parish, St. Paul, MN; 1996-2000 – Pastor at St. John the Baptist Parish, Egg Harbor, WI. Upon his retirement from full-time ministry in 2000, he moved to St. Henry’s Oblate Residence in Belleville and continued to be of assistance at the Shrine of Our Lady of the Snows and on weekends, in various parishes of the Belleville Diocese. He was preceded in death by his parents, as well as by his sisters, Sister Mary Margaret Kuryvial, OSF and June Gadas. Mourning his passing are his sisters, Barbara Punzo of Berwyn, IL, and Rosemary Ring of Weston, FL; a brother-in-law, Lubomir Gadas of Berwyn; six nieces and nephews. In lieu of flowers, donations for the Missionary Oblates of Mary Immaculate would be greatly appreciated. Visitation: Friends may pay their respects from 10 a.m. until 11 a.m. Saturday, August 11, 2018, at the Chapel of The Esquiline Apartment Community at Our Lady of the Snows Shrine, Belleville, IL. Funeral: A Mass of Christian Burial will be at the Esquiline Apartment Community Chapel at Our Lady of the Snows Shrine, Belleville, IL at 11:15 a.m, Saturday, August 11, 2018, with burial at the St. Henry’s Oblate Cemetery in Belleville.